These four dwarf galaxies waited billions of years to come together, setting off a fireworks show as thousands of new star clusters come to life. The distorted galaxies are quickly producing massive, hot, young stars that are pumping out ultraviolet radiation, heating up surrounding gas clouds, and causing them to glow. Such encounters between dwarf galaxies are normally seen billions of light-years away and therefore occurred billions of years ago. But these galaxies, members of Hickson Compact Group 31, are relatively nearby, only 166 million light-years away. In this composite image of the galaxy grouping, the bright, distorted object at middle, left, is actually two colliding dwarf galaxies. Myriad star clusters have formed in the streamers of debris pulled from the galaxies and at the site of their head-on collision. 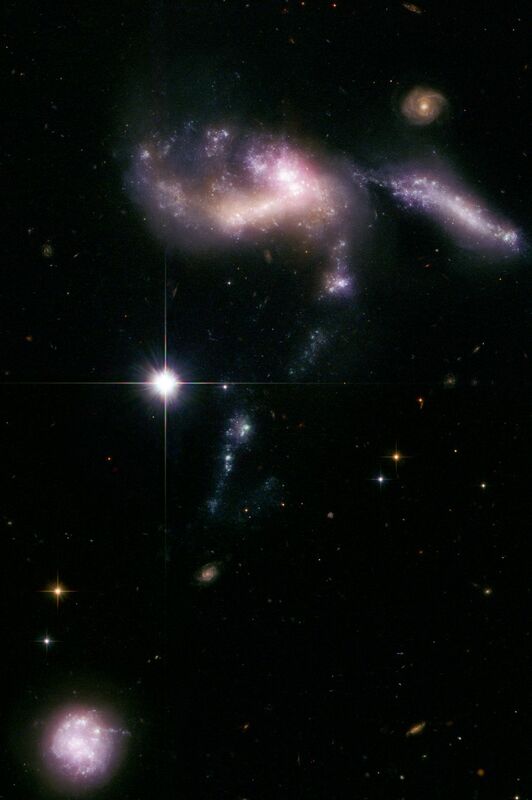 The cigar-shaped object above the galaxy duo is another member of the group. A bridge of star clusters connects the trio. A long rope of bright star clusters points to the fourth member of the group, at lower right. The bright object in the center is a foreground star. The image was composed from observations made by the Hubble Space Telescope's Advanced Camera for Surveys, NASA's Spitzer Space Telescope, and the Galaxy Evolution Explorer (GALEX). Astronomers used Hubble's Advanced Camera for Surveys to resolve the youngest and brightest of star clusters, which allowed them to calculate the clusters' ages, map the star-formation history, and determine that the galaxies are starting the final stages of galaxy assembly. Hubble reveals that the brightest clusters, hefty groups each holding at least 100,000 stars, are less than 10 million years old. Astronomers say the interacting galaxies will form a large elliptical galaxy in another billion years.